CLAREMONT, Calif. — They may as well have played on their own home courts, or at Lisbon High School for that matter, 3,000 miles away. But one of the greatest moments in the history of Bates athletics was a win over virtual neighbor and arch rival Bowdoin, decided in Southern California late Sunday night. 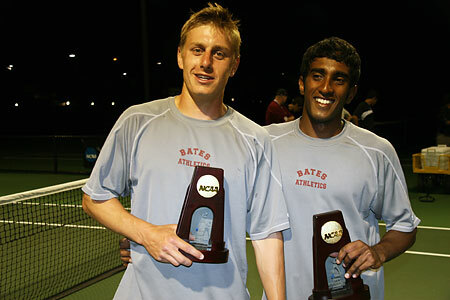 Bates College pair Ben Stein and Amrit Rupasinghe defeated Bowdoin duo Jamie Neely and Oscar Pena 6-4, 5-7, 6-4 for the NCAA Division III Men’s Tennis Doubles Championship on Sunday night at Claremont-Mudd-Scripps. 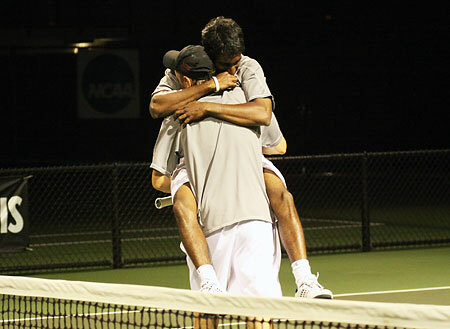 Just five minutes before midnight back in Maine, Bates clinched its first NCAA tennis doubles title when Stein, at net, volleyed back a Bowdoin shot to win the final point, following a Rupasinghe serve, at 40-0. 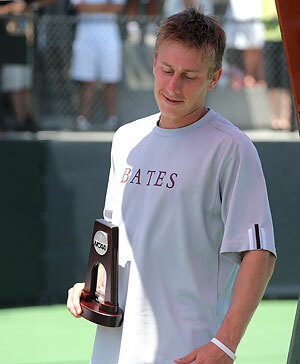 It is the second NCAA tennis crown overall (Will Boe-Wiegaard won the singles title in 2006) for Bates, as well as the second NCAA championship ever for Bobcat athletics in any sport other than track and field. Stein (Pelham, N.Y.) and Rupasinghe (Colombo, Sri Lanka) defeated Washington University in St. Louis doubles team Charlie Cutler and Chris Hoeland 7-6 (2), 3-6, 6-4 in the semifinals late Sunday afternoon. It was the second straight year the Bates pair has met and defeated the Washington University pair at NCAAs. Prior to the doubles win on Sunday, Stein — unseeded, just as he and Rupasinghe were in the doubles draw — was defeated in the NCAA singles championship by Emory University’s Michael Goodwin, 7-5, 5-7, 6-1. Goodwin edged Stein in the first set, 7-5, and led 5-3 in the second set. Stein held serve to close the gap to 5-4, then broke Goodwin’s serve to stay alive and tie the set up at 5-5. Stein rode the momentum to capture the next two games and win the set, 7-5, sending the match to a third set, which Goodwin won decisively. Stein finished the season 21-7 in singles play. The doubles title wrapped up an exhausting three days for Stein in particular. The senior, who played at No. 6 singles for Bates as a freshman, played five singles matches and four doubles matches in the three-day span of the singles and doubles championships, going 4-1 in singles and 4-0 in doubles. In all, he played 24 sets over the three days, including three tiebreakers. Stein, the Bates senior, won two singles matches on Saturday to advance to the finals of the singles championship. 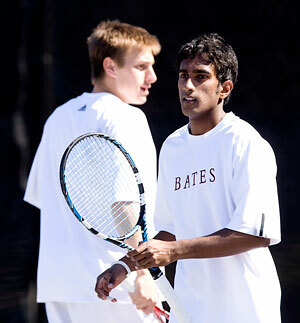 He then teamed up with Rupasinghe to play his sixth match in two days, and Bates’ two-time All-American Bates duo won that match, too, to advance to the semifinal round. Stein defeated the top seed in the 32-player field, John Kauss of Gustavus Adolphus, 7-5, 7-5, to reach Sunday’s championship final. Prior to his semifinal victory, Stein defeated Andrew Wang of Johns Hopkins University in the quarterfinal round on Saturday morning, dropping the first set and edging Wang in a tiebreaker in the second set to stay alive, eventually winning by a 2-6, 7-6 (5), 6-0 score. 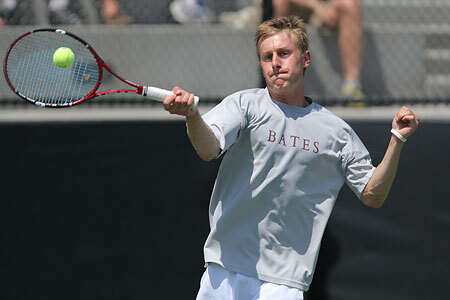 Stein becomes the third Bates player to reach an NCAA final. His teammate for one year, Will Boe-Wiegaard ’06, played in the final in both 2005 and 2006, winning the championship in 2006, and Buddy Schultz ’81 was the first to reach the singles final, in 1981. 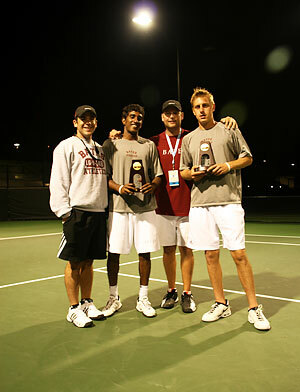 Stein and Rupasinghe then faced the Kenyon College pair of Michael Greenberg (the 2008 NCAA singles champion) and Will VandenBerg. The Bobcats won the first set in a tiebreaker and cruised in the second set for a 7-6(1), 6-2 victory. The Bates College men’s tennis team saw its top singles player and its top doubles team both earn All-America honors on Friday at the NCAA Division III Tennis Championships. Stein won two singles matches to advance to the quarterfinals of the singles championships, before he teamed up with Rupasinghe to win in the first round of the doubles championship. Stein defeated Robbie Erani of host Claremont-Mudd-Scripps 6-1, 2-6, 6-2, in the first round of the singles tournament. The win clinched Stein’s second career All-America honor and his first in singles play. Stein, who is making his NCAA singles debut, advanced to face Mark Boren of Emory University in the Round of 16, defeating the NCAA championship veteran by a score of 6-4, 6-4. The doubles portion of the tournament began after two round of singles play, and Stein and Rupasinghe, who made it to the semifinals of the doubles tournament last year but were not seeded this year, matched up against the second-seeded team of Max Liberty-Point and Ilya Gendelman of UC Santa Cruz. The Bobcats fell behind early as the Banana Slugs won the first set 6-3, but they rebounded with consecutive 6-3 set wins to advance to Saturday’s quarterfinals. Stein’s success was all the more stunning considering his tennis background, which unlike most of the other players at the NCAA Championships didn’t include the junior circuit as a teenager.